Summoned to action by surviving students of the Marjory Stoneman Douglas High School, Parkland, Florida shooting that left 17 people dead, millions of teenagers and their supporters rallied in protests in more than 800 cities across the USA on Saturday, March 24, demanding change – gun reform. They are simply fed up with government inaction and the power of the ‘gun lobby’, e.g., NRA (National Rifle Association) to curb gun violence. They came to demand a stop to the culture of gun violence that has taken lives of so many of their friends inside and outside the classrooms. 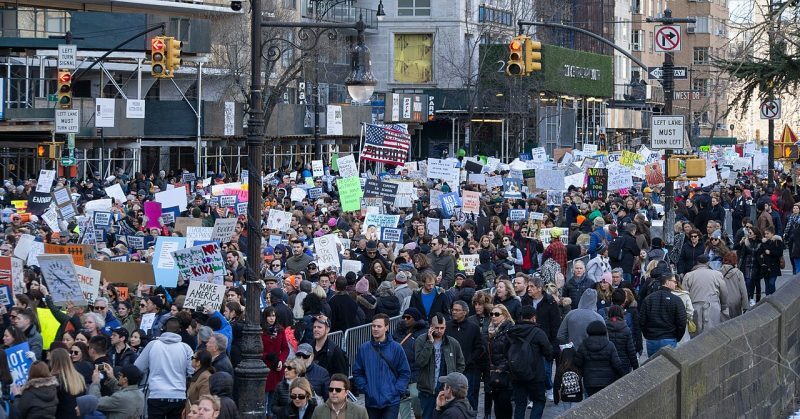 The New York City rally alone drew more than 175,000 people. The DC rally brought many celebrities to the event showing their support for the legitimate demands of the students. One person notably absent was the POTUS; but many lawmakers showed up to lend their support. Large rallies with crowds estimated in the tens of thousands in some cases also unfolded in such cities as Philadelphia; Boston; New York; Los Angeles; Chicago; Houston; Seattle; Fort Worth, Texas; Minneapolis; and Parkland, Florida, the site of the Feb. 14 attack. Chanting “Vote them out!” and bearing signs reading “Books Not Bullets”, “Am I Next”, “Ballots Not Bullets”, “We Are the Change,” ”No More Silence”, “Gun Control Now”, “Ban Assault Weapons” and “Keep NRA Money Out of Politics,” the protesters packed Pennsylvania Avenue between the Capitol and the White House. In the past 40 years, I have never witnessed student rallies like these in this country. Unlike their counterparts in Asia, Africa and Latin America, the student community here in the USA always seemed to be too apolitical. Outside their studies and fondness for the newer gadgets in social media, most students appear to enjoy outdoor activities, sports, and community services over the weekends. During my college days in the early 1980s, the only protests we successfully held inside the University of California campuses were organized by progressive student groups that were affiliated with the CISPES (Committee in Support of the People of El Salvador) and the Third World Coalition. But those rallies did not attract large segments of the student community even in some of the most liberal campuses in the USA. At the University of Southern California, I recall participating in anti-Apartheid rallies in the mid-1980s, which were participated by students, faculty and staff members alike demanding divestment from South Africa. Again, however, the size of the participants was not too large. Most students were either unmindful or unconcerned about what their government was doing overseas in the third world countries. I am told that these March rallies on Saturday (March 24) are one of the biggest youth protests since the Vietnam era. I am not surprised. America needs gun reform or control. Students need safety and not indifferent public policies that make them casualties of gun violence. Protesters denounced the NRA and its allies and complained that they are afraid of getting shot in school and tired of inaction by grown-ups after one mass shooting after another. They called for such measures as a ban on high-capacity magazines and assault-type rifles like the one used by the Florida killer, tighter background checks and school security, and a raising of the age to buy guns. Since the bloodshed in Florida, students have tapped into a current of gun control sentiment that has been building for years — yet still faces a powerful foe in the NRA and its supporters in the Capitol Hill and many state governments. Organizers hope the passions of the crowds and the under-18 roster of speakers will translate into a tipping point starting with the midterm congressional elections this fall. In addition to pushing for tighter gun laws, the students have been working to register young people to vote, and change the entire dynamics by electing those who would be tough with the gun lobby. After all, only one in five young voters between the age of 18 and 29 votes inan election. But the struggle for change will not be an easy one given the gun culture America is addicted to. African-American communities have had a deep resistance to guns, dating back to the civil rights era, when blacks, often victims of gun crimes, began to see gun ownership as counterproductive and dangerous. However, that mood has been changing fast since the ‘Black Lives Matter’ movement, which showed that those unarmed black men are 2.5 times more likely to be killed by police than unarmed white men. The Second Amendment is no protector for them, and is unequally applied and abused along the racial lines. The Supreme Court of the United States has ruled that the right to carry guns belongs to individuals, while also ruling that the right is not unlimited and does not prohibit all regulation of either firearms or similar devices. State and local governments are limited to the same extent as the federal government from infringing this right, per the incorporation of the Bill of Rights. Federal courts have further defined the amendment as not applying to the states, a collective right, pertaining to the militia, and protecting only those situations where it can be proved that an individual possessing a firearm has some relevance to a well-regulated militia. Although this ruling has been documented, a more recent ruling (2008) defined the right to bear arms as an individual right. The controversy revolved around the interpretation of this right revolves around a few basic questions: Does the Second Amendment mean that any individual has a right to carry a gun? Does this amendment only reflect gun control and gun rights of a militia or for the individuals in that militia? How does this amendment extend towards individual right to carry a gun with respect to concealment? As I see it, the second amendment has raised more questions, controversy, and court rulings than any other law or right in US history, and the issues surrounding it will not evaporate anytime soon, esp. with powerful lobbies promoting gun ownership. America has a gun culture, probably unmatched by any other nation in the globe. My hope is that with the student-organized rallies and protests throughout the country, Americans will not be able to ignore the hideous gun-culture that they inherited, which has killed so many for so long. According to a Reuters/Ipsos national poll taken in early March, a majority of Americans, including Republicans, Democrats and gun owners want stricter laws on gun ownership and armed guards in schools. That is a positive development towards a change for gun control. At the same time, the poll found that nearly half of Americans do not expect elected officials to take action. That perception has been a sad reality here in Abraham Lincoln’s country where more and more electorates feel that democracy is failing them and that big and powerful lobbies control their lives. However, judging by the mood of the nation this weekend after the March for Our Lives, I am sure more elected reps would find it difficult to either ignore the student demands for tougher gun-control or back the NRA (that is financed by the gun manufacturers), esp. those facing reelection this year. They need to earn the trust of the people and act right to avoid being ignored in the ballot boxes. Establish a culture of gun safety by – (1) reducing firearm access to youth and individuals who are at risk of harming themselves or others; (2) holding the gun industry accountable and ensure there is adequate oversight over the marketing and sales of guns and ammunition; (3) engaging responsible gun dealers and owners in solutions; (4) insisting on mandatory training and licensing for owners; and (5) requiring safe and secure gun storage. Eighteen years ago, hundreds of thousands of mothers and other gun control advocates marched on the nation’s capital and in several cities around the country on May 15, 2000, demanding “sensible gun laws,” and chanting ‘enough is enough’, mourning the loss of children to gun violence and vowing to transform the politics of gun control. The Million Mom March crowded the grassy expanse of the National Mall, cheering one speaker after another who assailed the National Rifle Association and its power over Congress. As noted by Robin Toner of the New York Times, many of the demonstrators wept at the stories of mothers who had lost their children, listening transfixed to the families shattered by shootings from Columbine High School, in Littleton, Colorado, where 15 died in 1999, to the Michigan elementary school where a 6-year-old girl was killed by a classmate on Feb. 29, 2000. The teenagers who spoke at the March for Our Lives this Saturday were no less eloquent and specific about their pains and demands than those moms that rallied nearly 18 years ago. Perhaps, this time the nation is more serious and ready for finding a solution to gun violence. If the federal and state governments fail to deliver against gun violence America will only see more of the same hurting them in coming years. Is that the future that they crave for? Surely not!